Entry Fee: $30 OHCA members, $40 non-members, for up to three pieces. Become a new OHCA member at the time of delivery and get your entry fee waived! Call or Click here for more details on membership. Explore the communicative power of line in art. Line, Area, Space, Colorandthe Human Psyche. straight – curved, measured – random, long – short, heavy – light. How do you use the line in your art to communicate? Submit works that have an emphasis on LINE! Some well known artists who masterfully used the line: Piet Mondrian, Agnes Martin, Wassily Kandinsky. 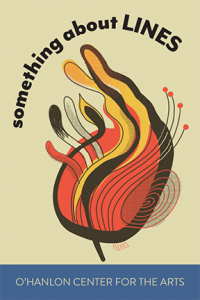 Contemporary, expressionistic, abstract, exploratory, and/or experimental entries encouraged. O’Hanlon Center for the Arts emphasizes the creative process and the continued pursuit of meaning and authenticity through observation, exploration, and experimentation. Open to all artists age 16 and over. Submission limit: 3 works per artist. Please do not submit works previously displayed in the O’Hanlon Gallery. All work must be ready for display. Paint, glue, etc. must be dry! Wall hung pieces must be securely wired. Label all work with Artist’s name, Telephone, Medium, Size & Price, if for sale. Please note Entry Dates/Times carefully. Late delivery of artwork is not possible. For most exhibits, not all artists will have artwork selected for showing.Final artwork selections are up to the Exhibit Juror(s) and/or Installer/curator, both of which vary from show to show. Accepted work must remain on view for the duration of the exhibition. Artists agree to make a 30% tax-deductible donation to OHCA from all sales. While all reasonable care is taken with submitted artwork, OHCA strongly recommends that exhibiting artists carry their own insurance. OHCA and representatives will not assume any liability for any damage or loss. By submitting work, artists agree that photographic images and/or video of the artist and/or their artwork, in whole or in part, may be used by OHCA for publicity in various forms including print, online and social media. “I am a gestural abstract artist, taking my cue from nature. My work is at once personal and universal, like looking out a window and seeing life through my own point of view, but knowing others will have their own unique response. I am particularly influenced by the colors and energy of nature and the ever-changing environment. Line, color, shape, and movement all invoke feelings, daydreams, longings, and collective memories. In working abstractly the work is never fixed, but dynamic—one can see infinite relationships. where creativity and community can develop, expand and flourish. 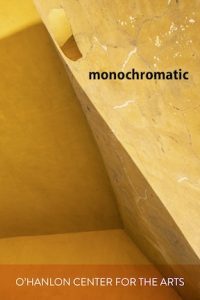 How expressive can you be utilizing a single base hue but employing as many of its shades, tones and tints as you require? Monochromatic artworks can be based on any single color, not just black & white. For example, in the Blue spectrum we have Azure, Cobalt, Cerulean, Ultramarine, etc. Reds might include Garnet, Crimson, Rose…the possibilities for explorations within each hue are endless. For inspiration, consider a few well known artists who explored the possibilities of working in monochrome: Agnes Martin, Mark Rothko and Gerhard Richter. Galleries are closed Feb 22-26 for show changeovers. 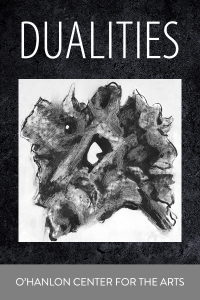 We invite artists to submit works that feature some aspect of DUALITY as a primary theme or focus. Dualities are an instance of opposition, contrast or other relationships between two concepts. Dualities can be experienced everywhere: light–dark, stillness–movement, plus–minus, hot–cold, rough–smooth. They can also be seen in mirrored reflections, or pairings of mates, couples or twins. Will you focus on the contrast between the two aspects, or reveal some unifying connection between the duo? 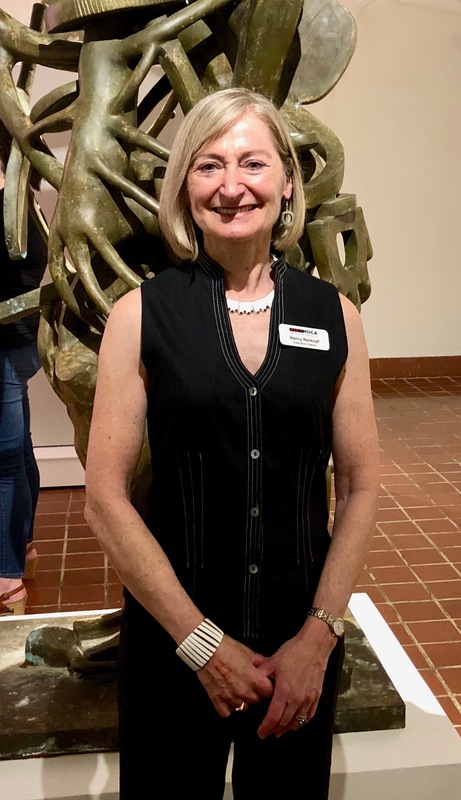 Nancy Rehkopf is Executive Director of the Marin Museum of Contemporary Art, where she presents seven contemporary art exhibitions annually and works with over 160 artist members. Nancy has served on the board of directors of Youth in Arts, Marin Open Studios and Marin Symphony, where she is currently Vice President. She taught business at Dominican University after retiring from a career in corporate marketing. Entry Fee: $30 OHCA members, $40 non-members, for up to three pieces. Special Offer: Become a new OHCA member at the time of art delivery and receive one free entry! Call (415) 388-4331 or visit ohanloncenter.org for more details. Travel leads us to have uncommon experiences; as we step out of our comfort zones, we often see the world with fresh eyes and a sense of wonder. 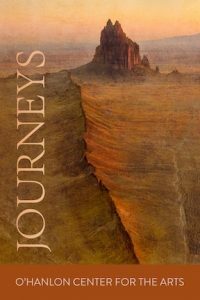 We invite artists to submit work for our next exhibit “JOURNEYS.” Submitted work should relate to some aspect of travel, adventures, or journeys taken – real or imagined. Witness Gauguin’s adventures in French Polynesia, or Van Gogh’s travels to the south of France. We hope to see artistic expressions relating to the artists’ own personal explorations of the world, from far to near… including abstract, experimental or representational works. MEDIA: All Media, including 3D/Sculptural works. Works previously displayed in the O’Hanlon Gallery are not eligible. Label all work with Artist’s name & Contact information. Please note Entry Dates/Times carefully. Late delivery of artwork is not allowed. For most exhibits, not all artists will have artwork selected for showing. Final artwork selections are up to the Exhibit Juror(s) and/or Installer/curator, both of which vary from show to show.